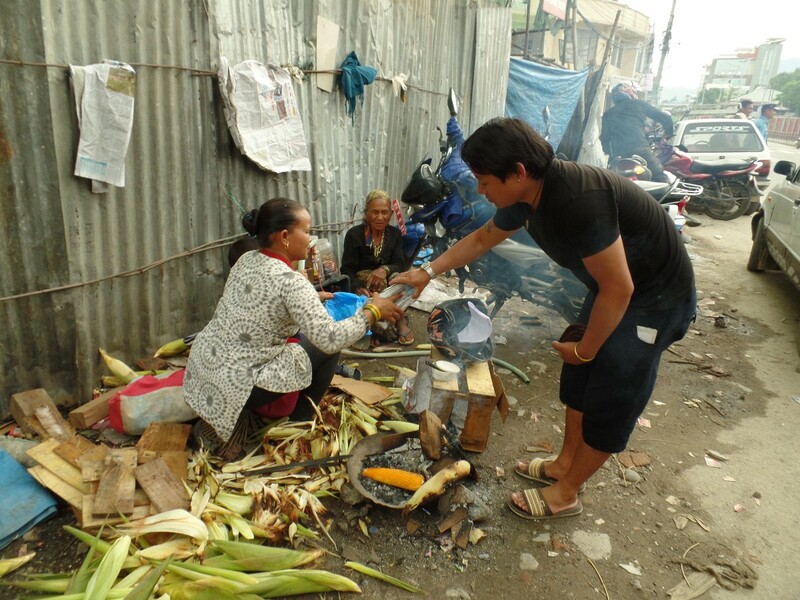 Tika has been roasting corn (maize) and selling on the streets of Kathmandu for over 18 years. Over at hackproject.org we have been trying to bring to light problems like the one for Tika to not only create awareness, but also for people to hack projects that will aid Tika and 1000s like her. In this regard, we talked to Tika about her life, her way of making a living and the challenges she faces on a daily basis. Tika has been selling corn in a corner of a busy road crossing at the heart of Kathmandu city for over 11 years now. For 18 years she has been making her living this way and raising her son. She is aided by her mother in law from time to time, but mother in law has grown old. Tika gets her to her open shop for company now. Her son studies, but while not at school, he is beside her in the open fire. Tika sells corn to any passerby willing to buy from her. In addition she also has added a small wooden box from which she sells sweets and other products that her corn buyers want to buy on the quick — small items that people need. Most people are patient enough to wait the 5 to 10 minutes she requires to get the corn ready. Some just leave, some complain about the right amount of roasting. Some of the corn get burnt. As her cooking is done is a pan with wood and coal, she cannot control her fire. Also the smoke can be very distracting. Most times she fails to provide the right consistency in the corn thereby loosing valuable buyers and repeat buyers. She runs her open air, outdoor shop for around 10 hours a day. During that time she is exposed to nature’s elements including sunshine, rain, dirt, dust and garbage. To add to that there are vehicles, smoke and smoke she produces roasting the corn in open fire. 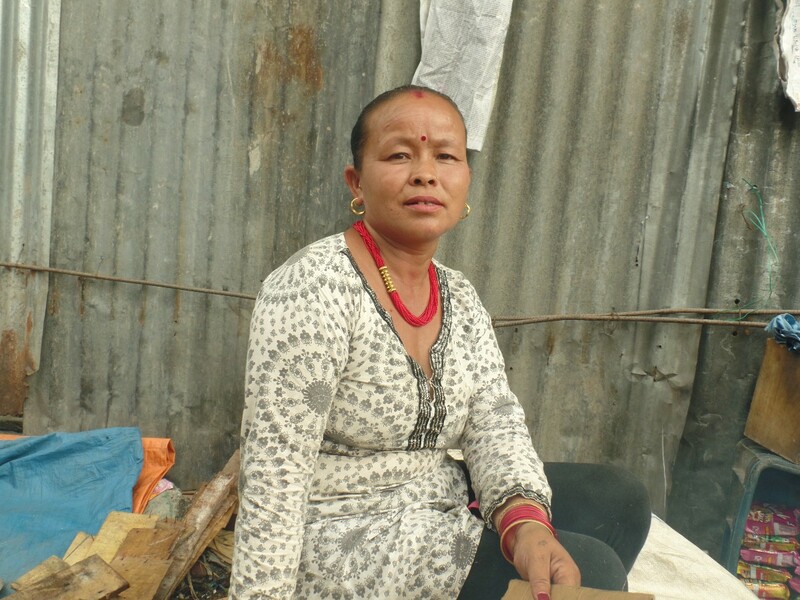 Tika says her life depends on running her shop and she cannot afford to be sick. Due to constant exposure to smoke and other natural hazards, she says she, her mother in law and her son are getting sick more often. Also they feel nauseated most times. 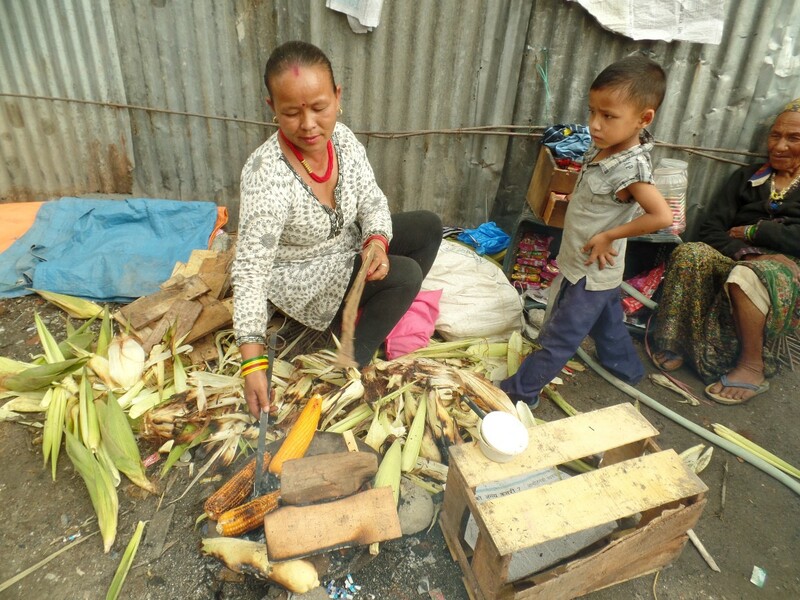 Like Tika, there are over a 1000 corn sellers in the streets of Kathmandu alone. Their daily lives depend on roasting and selling as many corns as possible. Most cannot afford a proper stall. That is why they either find a suitable street corner or wonder around with a trolley. As off now they sell corn for around 30 Nepali rupees per piece (approximately 30 cents US). The cost of buying corn, wood and charcoal is gone up. So they make a meager living even if they manage to sell 100 pieces of corn a day. The earning would be just enough to survive in a costly place like Kathmandu. Most don’t have any savings to take care of future or even in case of sickness. There is no insurance or any other way to help during emergencies. Both these result in loss of valuable business as well as have long term impacts on their health and on the regularity of the business. Too much smoke, not only creates a lot of health impact, it also wards off a lot of customers. As the roasting takes 5–10 minutes, customers get agitated and leave. Corn, once roasted, looses flavor if kept for a long time. While loosing a customer, corn can also be lost. When customers try to hurry, due to smoke, sometimes uncooked or not consistently cooked corn has to be given. This reduces repeated buyers. As the corn is roasted in open, uncontrolled fire, the consistency of cooking is very low. Edges tend to be raw, even when the middle of corn is already beginning to burn. Simple way around that corn sellers have developed is to roast corn with the leaves on. This allows steam cooking and creates much more consistency, but uneven fire still hampers the quality of cooking. The third factor, that results from the above two, is delivery time of the roasted corn and storage after the corn is cooked. As customers tend to walk away if the cooking time is too long, it becomes important to cook as fast as possible. Tika thought of pre-cooking or half-cooking, but she needed another fire. With little space to do anything she could not make more pans. Also pre-cooking at home is not a possibility for her. Regarding storage the flavor reduces very fast as soon as the corn is removed from the fire. So one option Tika and others have adopted is to keep the corn in the fire as long as possible. In the same pan, they make corners where they try to reduce the fire as much as possible and keep the roasted corn in low heat. This works for the same day, but not for another day. Whatever the problems faced and how much hurdles to be overcome, Tika’s life depends on selling roasted corns and so does for over 1000 others. Tika feels that if someone could make a controlled stove that she could still use outdoors, but it would tackle her problems of smoke, consistency in cooking and if possible for storage it would make a life a little better. Her health, she feels, she needs to really take care for not only for herself, but also for her son.